The Connects international series returns to the US, and for the first time it will be held in Seattle with Pocket Gamer Connects Seattle on May 13th to 14th 2019 - and you can get in without spending a cent. 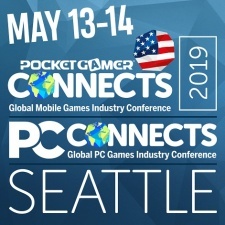 With 13 conference tracks and two industry events - Pocket Gamer, and PC Connects - the event will host 750 attendees across the two days. There will also be expo space, networking sessions, Big Indie Pitches, investor panels and more. With all that going on, tickets cost hundreds of dollars, but there are four ways that indie devs, students and the media can get in free - and you can’t argue with a price like that! Not ready to join the fray of the Indie Pitch? Fear not, for ye may still enter the show floor armed with your latest build with which to bedazzle all and sundry. In other words, we’re giving away some space on the expo floor to a select few indie devs - complete with free entry to the show. Sweet! Get in here. Applications close at midnight tonight (April 15th)! Whether you’re studying event management in college, just started making the tea for a start-up studio or want to meet the people behind your favourite game, signing up as a volunteer grants you access to the hallowed hallways of Pocket Gamer Connects. You can apply here. So that’s four ways you can get into the leading B2B games industry event completely free of charge - it’s up to you to choose which one works for you!